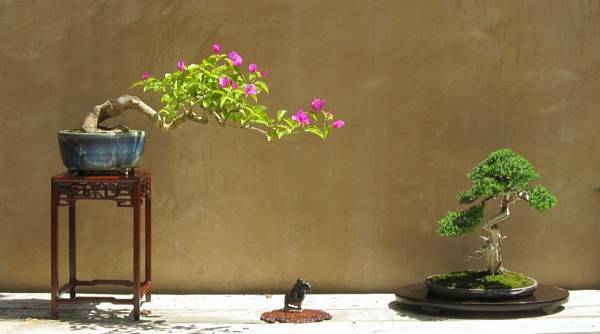 John Naka's lantana on display during the first Bonsai-a-Thon. In 1996, Gloria Stuart was aboard a Russian scientific research vessel in front of the cameras for James Cameron's movie Titanic. While she was playing “Old Rose,” another production was taking place at the Huntington Library and Botanical Gardens in San Marino, California. The first annual Bonsai-A-Thon fundraiser to support the Golden State Bonsai Federation – Collection South was in the planning stages, and yours truly was the one making the plans, with the generous help of the bonsai community. 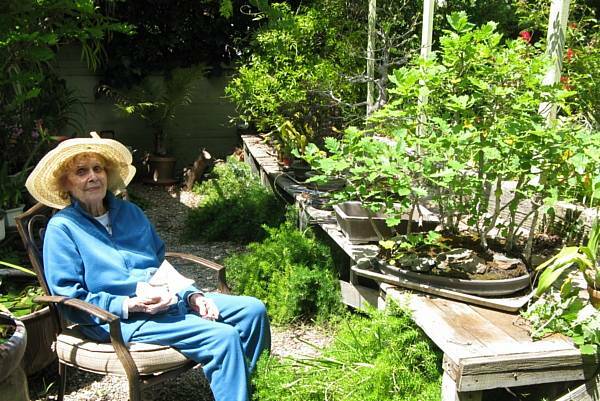 Gloria Stuart was one of the many bonsai artists who participated or contributed items to the fundraiser's success. Gloria relaxing in her garden. 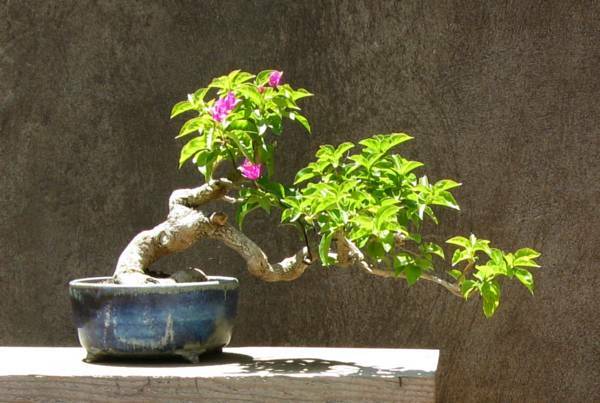 In early August 1996, Gloria gave me a tour of her bonsai garden and a spot of tea before donating two of her creations for the raffle table: a limited-edition silkscreen print of kites titled “A Beautiful Summer Wind” and a small bougainvillea bonsai. As I loaded them in my car, I decided I'd try to win one of them. Both were special items with their own raffle ticket cans. The can for the silkscreen print was loaded with tickets, so I abstained (and Ted Matson became the lucky winner). However, the bougainvillea's can was almost empty, so I stuffed it with several dozen tickets and smiled when my name was called as the winner. 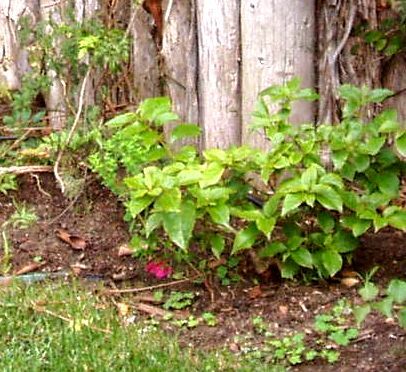 Gloria's bougainvillea growing in the ground. Why were there so few tickets in the can for Gloria's bougainvillea? Let me count the ways. One large root coiled around the soil surface like a snake before it went underground. There was reverse taper midway up the trunk where five branches emerged. The leaf color was more yellow than green. Although it was August, there were no flowers on the tree. John Naka often said, “If a tree is sick, small, or uninteresting, put it in the ground.” This tree had all three strikes against it, so when I brought it home, I didn't even bother to photograph it. I immediately took John's advice. 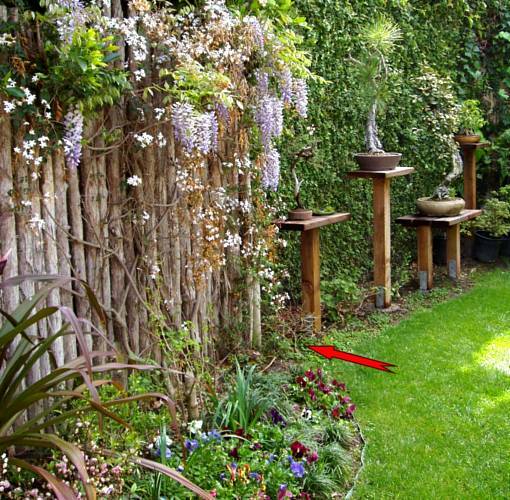 For a number of years, it was a bush in my backyard landscape getting healthy, growing larger, and gaining interest. Much healthier after a few years in the ground. The original style of Gloria's bougainvillea was a slant. The top half of the tree was weaker and less interesting than the bottom half, so I removed it before putting the tree in the ground. I let the tree grow wild for a year or two before making big cuts. This routine was repeated several times before I dug it up and potted it. Before the tree went into the ground, I thought it had potential to be a windswept or semi-cascade. When I dug it up, there was no decision to make. The tree was well on its way to becoming a gorgeous semi-cascade. A beautiful blue-glazed pot by Sara Rayner complemented the tree. The pot's round shape echoed the less-than-perfect (yet interesting) coiled root. The height was ideal for the new design. In a beautiful pot with an awkward apex. The bones of this tree had nice taper and gentle movement, but there were too many of them. The apex had an awkward bend that distracted from the beautiful flow of the semi-cascade. By removing it, I was also able to cut away reverse taper. The bottom fork in the cascade before it was removed. The main cascade forked into two trunks which crossed each other. A thick cluster of branches surrounded them, creating a tangled mess. 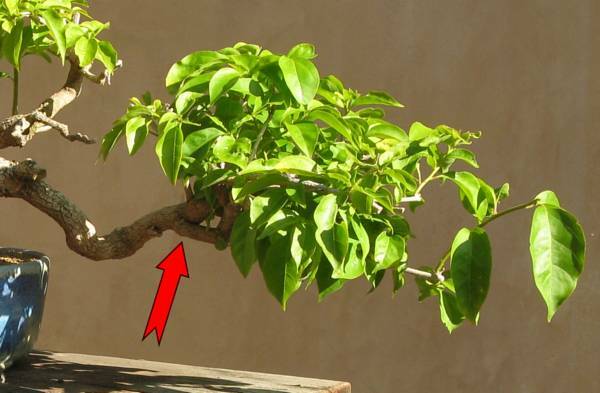 The upper trunk had a nicer flow, so the lower one was removed and branches were thinned out. After the apex was removed, but before old cuts were carved. Bougainvillea are not great at healing over cuts. Several branch cuts near the apex looked like boring belly buttons. I carved subtle circular grooves into the flat cut to give some character without grabbing attention. 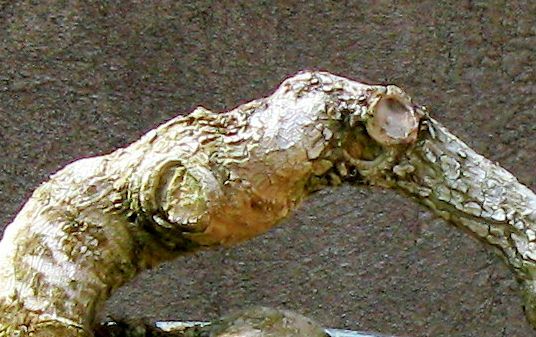 The color of the dead wood matched the pale bark which blended to allow your eye to focus on the best feature – flowers. In the first fourteen years I had this tree, I saw only a couple of flowers. Then last year, out popped five flowers on the apex. 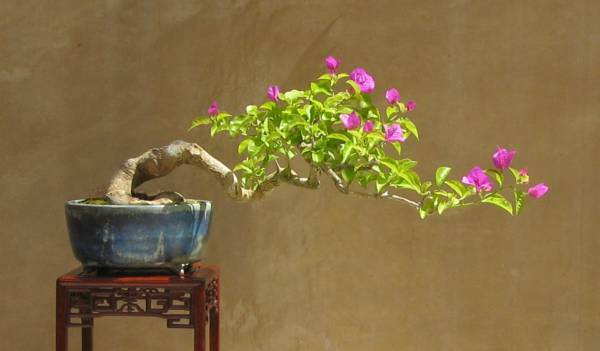 This year, just before the 3rd US International Bonsai Exhibition in Rochester, New York, the bougainvillea sported about two dozen flowers. Gloria's tree was finally ready for its closeup. This tree had never been shown before, so I was thrilled to throw it on the refrigerated truck and send it east to have it debut in such a beautiful show. 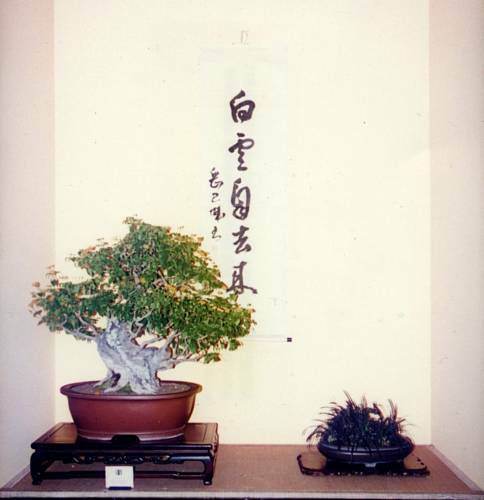 It was paired with another small tree – a procumbens nana juniper in a two-tree display – but that's another story. Elevated above a procumbens nana and a tiny Han Dynasty horse and rider. It's showtime for the first time.